We’re back for the Normal-type reviews, and today we’re going to focus on Kangaskhan, two beings, the mother and child, are treated as one Pokémon! If you are ready with this one, please proceed. Kangaskhan is an odd Pokémon. It is named after a kangaroo, yet doesn’t look like one. But since its species name is known as a Parent Pokémon, I guess it’s not so notorious. Besides that, its baby seems like it is part of the Pokémon that it won’t be Kangaskhan without it, making the two dependent to each other in a sense. Kangaskhan, as its name suggests, is based on a kangaroo in such that it has a pouch in front to keep its baby in, for safety. Of course, only the females have them, which is why Kangaskhan is a female-only species. It should be noted that other marsupials such as the wallabies and koalas also have pouches for females, but the kangaroo is most well-known with this feature. There was a myth surrounding the kangaroo where it came from the phrase “I don’t understand you” (sounds similar to Audino, to be honest) in another language, but that is not the case, because the word is just a name for the animals. Though Kangaskhan is named after a kangaroo, it doesn’t really look like one. 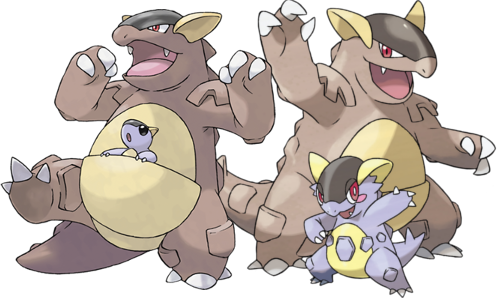 Having a pouch is one thing, but Kangaskhan has stubby legs that are not used for hopping like the kangaroos, and its head is monster-like (for one, kangaroos don’t have fangs), the tail is thick whereas kangaroos have longer and thinner tails, and its skin looks more like a rhino’s compared to the kangaroo’s furry one. Instead, it develops its own traits that take after another thing, which is where the “Khan” part of its name comes in. The “Khan” part of the name apparently came from “Genghis Khan”, the founder of the Mongol Empire, and its body looks like it is wearing armour, including the epaulettes. This is most likely a response in designing Pokémon to be used for battle, because a lot of Generation 1 Pokémon look like they are designed to look like ideal battlers. I believe that if Kangaskhan were to be designed in a later Generation, it would look more like a kangaroo than a monster that takes after some of a kangaroo’s traits. A lot of its PokéDex entries mention how attached to the child this Pokémon is. In fact, Kangaskhan is really protective that it will not take anybody dealing with its child kindly. So that the child does not get crushed, Kangaskhan sleeps in an upright position. It does let its child come out from its pouch when it is safe, because eventually it will need to be out on its own, but it especially needs to be able to look for food on its own, which is said to be three years after birth. Despite what the PokéDex entries said about Kangaskhan, some of what is said isn’t carried out in the games. For example, when Kangaskhan hatches, it will become a Pokémon with both mother and child, meaning this newborn already has a child. 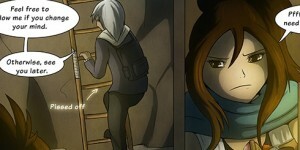 It also seems that this child never grows up and is forever a child in the mother’s pouch. That’s not all: in one of the PokéDex entries, it is insinuated that there is a father, as in, a male counterpart. To be fair, that was mentioned in Generation 1, where there wasn’t a distinction in gender (though it got mentioned again in FireRed) before becoming a full-time female species. Kangaskhan’s child is, so far, not made into a separate Pokémon, as if the two are treated as one entity. When it comes to baby Pokémon, Kangaskhan would’ve been an ideal Pokémon to receive one because it made a lot of sense as a Parent Pokémon. One popular suggestion is that the child is the same a Cubone (without the skull), or at least related. This might come from how Cubone and that child is similar, but there are enough differences for both to be considered distinctive. The child gets to leave the pouch when Kangaskhan Mega Evolve into Mega Kangaskhan, gaining the ability Parental Bond as a result. This child seems to have grown quite a bit. This essentially allows an attack to hit twice, with the other being weaker than the first by 50% if the hit is on one target. What this essentially means is Mega Kangaskhan gets a 50% power boost on every attack in Singles, making it way too powerful because each attack produces an effect, as in, Power-up Punch will boost Attack twice and Seismic Toss does 200 HP of damage, but luckily after-effect moves work once (Circle Throw forces a switch after the attack is done). This made Ghost-types ideal to deal with it, but even then, Mega Kangaskhan has moves that deal with them. In Doubles, it is more manageable through double-targeting, but it is also quite powerful there. If you do not take into account its Mega Evolution, Kangaskhan is not terrible, thanks to the ability Scrappy, allowing it to hit Ghost-types. It is also decently powerful and beefy enough to make use of Substitute and Focus Punch, as well as using its first strike moves Fake Out and Sucker Punch. The bonding between parent and child is sure to be a heart-warming aspect on this Pokémon, because it’s something we can relate to. Kangaskhan’s design, on the other hand, is too unique to be related to the species that it is inspired from, instead looking like a monster that lives up to the Pokémon name (because it’s called “Pocket Monsters”). It does look very appealing to the fans who like the tough kind of Pokémon, though. The bonding moment between the mother and child is played in an idealistic sense, where the environment is quite safe and free and beautiful. 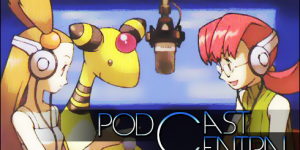 There are few cards based on Mega Evolutions, due to the EX cards having a similar effect in advancing the power level of a fully-evolved Pokémon. 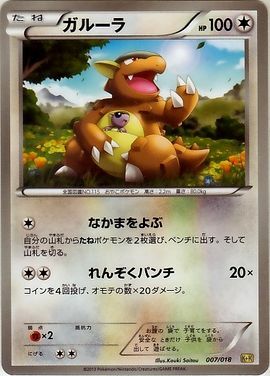 The main feature of this card is that the child of Kangaskhan has equal attention with its mother, showing that they are both in the battle together. 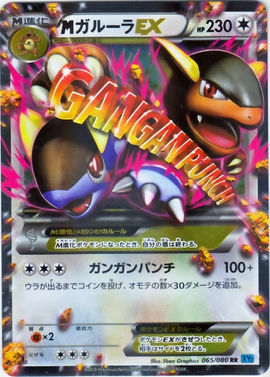 The text of this card is basically the attack’s name, which is in Japanese text for the English version of this card and the Romanisation of that attack’s name in the Japanese version. Double-Edge is also known as “Life-Risking Tackle”, so it makes sense for Kangaskhan to learn it, being quite protective with its child. There are also a lot of other Pokémon learning this attack, so they too could provide their own form of “Life-Risking Tackle”, in addition to being almost as universal as Return and Frustration when it used to be a Move Tutor. This is a good move for many Normal-type Physical attackers, if they want a strong attack to use. It high power is great, but it also causes recoil, so there is a risk in using an attack. It could even be used with Pokémon with move type-changing abilities like Mega Salamence’s Aerilate for a highly powerful STAB. If survivability is important, then the regular Return or Frustration will always be the best alternative, but if the Pokémon has a recoil-negating ability, then Double-Edge will undoubtedly be the better attack. Overall, this is a good alternative move for any Pokémon who wants a powerful Normal attack, but only if Return or Frustration doesn’t suit their needs (though that’s a rare case). That’s all for today’s article. I hope you enjoyed reading this as much as I have writing it.